The image is clear and stunning. A cowboy lies motionless in the arena dirt as a 1,600-pound bull continues to leap, kick and twist near him. Athletic men move in to protect the cowboy and entice the beast away. Fear and a sense of panic are natural, from fellow bull riders to announcers to fans. 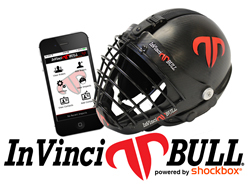 It’s that vivid image that has led to the partnership between Impakt Protective and InVinci-Bull in the creation of the Shockbox helmet sensors for bull riding. The relationship allows not only for better protection for the cowboys, but also a way many others to keep track of the types of forces that a bull rider faces during a ride. The Shockbox sensors weigh less than an ounce, but they provide great data that is transmitted via Bluetooth technology to any mobile device that has the appropriate application. For medical teams, the sensors will submit detailed information about the G-forces, points of impact and Head Injury Criteria. The non-medical app – for announcers, television commentators and any fan who wants to follow specific bull riders – will feature a less detailed report that is still fascinating. The Shockbox sensors are made by Impakt Protective, a developer of smart sensors. It’s CEO, Danny Crossman, created the first helmet sensors for the military to record roadside bomb blasts in Iraq and Afghanistan in 2006. The sensors also have been used in other sports: hockey, football, lacrosse and snow sports. The InVinci-Bull helmets were developed three years ago and were first tested at a Professional Bull Riders event in New York City. Since then, the company has worked with Simpson Racing, the primary safety products company in auto racing, to develop a lighter, yet stronger, product. “What we learned from Bill Simpson, who was the godfather for NASCAR and drag racing safety equipment, is they use carbon fiber for their helmets,” McGee said. “We decreased the weight by 30 percent, but we saw a 40 percent increase in structure strength. The National Intercollegiate Rodeo Association, which is the sanctioning body for college rodeo, has listed InVinci-Bull as its official helmet. The company also has reached endorsement agreements with PBR Australia champion David Kennedy, announcers Scott Grover and Matt West, and Richard Jones, a professional announcer and sound technician. The technology is incredible. More importantly, it’s a great tool for sports medicine personnel to use in their treatment of potential head injuries. That’s the most important message of all.